Select the Web Sign up Forms Option from the Lists Menu. 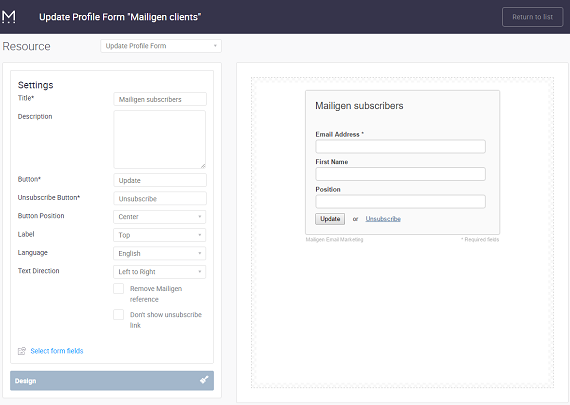 This will open the Form and Email Design Wizard. The first step is to select the list from the Mailing List Drop Down. Next, select the Update Profile Form from the Resources Drop Down. After you have selected the Update Profile Form you can make changes to the behaviour or design of your form through the Resource Settings section or the Design Settings section. Title—the title of the form. By default, this will be the same title as the list. Description—the form text that will appear above the text entry field. This should be helpful text explaining to users how to update their information. It's also possible to change the fields that will be shown on the form. You can do this by clicking on the Select Form Fields Link which will bring up the Subscriber Fields Window. Second, you can change whether fields are displayed on the form or required by checking the appropriate boxes. Third, you can edit the label, merge tag, and type of field by clicking on the Edit Link to open the Field Editor. Note: Editing fields is covered in more detail under the “List And Field Types” support topic. You can only edit custom fields. Fourth, you can add a new field by clicking on the Add New Field Link. This will add a new custom field title “Unnamed Field” to the bottom of the field list. To change properties, name, merge tag, etc. you simply need to click the Edit Button. Finally, you can delete a field by editing it and clicking on the Delete Field Link. The design of the Update Profile form will be exactly the same as the Sign-up Form (which is the master form) until you make and save any specific changes. The WYSIWYG panel shows you a real-time representation of your form or email as you are working on it. Changes you make to fields, labels, colours, sizes, images, etc. are reflected as you make them. When you have finished making your changes, click the Save Changes Button at the bottom of the editor window.